A harried parent called a few weeks ago. She wanted to know if the pollution levels in Delhi were bad and if so how bad. The answer was simple and obvious. But why do you need to know? Her daughter’s prestigious school (which I will leave unnamed) had sent a circular to parents, saying they are planning to shift to air-conditioned buses because they were worried about air pollution. She wanted to know if this was the right decision. My answer changed. The fact is that pollution levels are high and we do need to find ways to bring them under control. But the solution is not to think that the rich can find ways to avoid breathing the air, and so keep pollution at bay. I asked her if the school was also planning to build an air-conditioned funnel for walkways and an air-conditioned gymnasium so that children would not be exposed to this foul air. What an irony that instead of fighting pollution and demanding change, the city’s rich and famous —many drive big cars and run them on subsidised diesel—think they can escape this noxious air. They can opt out of the whole “dirty” system and even generate their own air to breathe. But escape is not so easy. Air pollution and, in fact, environmental degradation are great levellers. Consider this: there is more than enough evidence that in-vehicle pollution is often a greater risk than the air outside, however foul. Worse, air-conditioned vehicles are more polluted than those with no air-conditioning. A recent study from China (where pollution levels are certainly bad) shows that the air inside air-conditioned buses was dangerously high on air toxins like benzene, toluene and xylene. The level of toxins in these buses was higher than in open buses. This is easy to understand. The pollution inside a vehicle is caused by air intake—what the vehicle takes through vents from outside—as well as “self-pollution”—vehicle exhaust in the passenger cabin because of leakage. 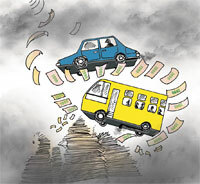 In air-conditioned and sealed vehicles, this trapped air circulates and gets even more concentrated in terms of exposure than just ordinary but dirty air. The air-conditioning system is not designed to filter bad air. In California, where also there is a serious ambient air quality problem, a study found that children in school buses with closed windows were exposed to much higher and unacceptable levels of air pollutants. In this case, the exhaust concentrations inside the vehicle were 2.5 times higher when the windows were closed as compared to when they were open. So, if you think you are “safe” inside your car, my advice is roll down the window and don’t smell the air but scream instead that pollution levels are hurting you and your child’s health. We also think that we can run away from pollution by moving to greener areas with less traffic in our cities and that we can find our island of clean air. But think again. In heavy traffic areas, particularly along main roads, air pollution is high. In most cities, growing use of diesel is leading to hazardous levels of nitrogen oxide. This toxin is particularly high in heavy traffic zones and main roads. We know this. What we do not know is that there is another present and invisible danger aground—ozone, which directly affects our lungs. But it is not to be found where you would expect it. High levels of nitrogen oxides and volatile hydrocarbons interact with sunlight to form ozone. But as nitrogen oxide then reacts with ozone and mops it up, this gas drifts to areas where there is little pollution. This way, ozone levels are high in the green areas of the city. This pollutant, formed from the toxic exhaust of vehicles, looks for safe havens where the air is clean. It is no wonder then that the limited studies conducted in Delhi—where there are ample sunny and hot days—found ozone levels highest in the green areas of Civil Lines in the north and Siri Fort in the south. The powerful rich of the world believe they can survive climate change, too. Their emissions may be the cause of this catastrophic problem, but the poor are vulnerable. So, the rich do nothing to reduce emissions at the scale and pace needed. They are not victims, and they can “adapt”. They will build sea walls to keep out the next storm and they have enough food and money to buy their way out of the next drought or flood. They do not have to worry. Not seriously at least. This is simply not true. The fact is that the rich may have the financial resources to cope with climate-related disasters the world is seeing today. But this is because global temperature increase is still only 0.8°C with another 0.8°C in the works. But this is before climate change spirals out of control when global average temperature increase gets to 3°C and above. At this level, even the richest will find it difficult to survive. So, let us be clear that there is no escape route. We cannot run. We have to stay and fight. And we have to win. It is in the interest of all of us. Post script: The school, I have been told, has gone ahead and bought air-conditioned buses. The literate Indians are clearly environmentally illiterate. The pollution explosion has various causes acting together while people, in general, keep looking for individual escape routes. However, the basic cause for all this concerns ultimately with the ever growing greed and the degrading human values in terms of our respect for a simple basic human-being. I will like to look at the planning of city-developments so that we enact a law which provides legitimate space to the non-polluting commutators as part of the fundamental right to live. i)a mandatory law for providing Surface-connectivity of various important points in a city should be planned for the foot passenger/cycle users besides for the users of motorized vehicles. ii) The large new housing colonies/complexes should plan and necessarily have walker-cycle friendly routes besides ones for motorized vehicle users. No new large scale road development project should be cleared without inclusion of a walker/cycle friendly routes. Loved this article for the way it argues the case and particularly the hard hitting concluding lines.Although not in a habit of `commenting', i was compelled to write a few lines of appreciation. Sunita Narain is gifted thinker and one of the impactful writer. A concise and brilliant exposition of the situation. The bottom line as far as environmental degradation is concerned could not have been spelt out more clearly. I have always wondered about the precise extent to which the well-to-do could build oases (such as gated communities) in the middle of a desert of poverty and misery, and live oblivious to their surroundings. After all, I thought, they would have to step out of their air-conditioned cars and tread on the filthy streets for at least a few steps before disappearing into the safe havens of their homes and offices---or at least take a few breaths of diesel fumes, even if those few steps were on well-paved, clean ground. But now it turns out that the very air is polluted everywhere, and that there is no escaping it unless one carries an oxygen cylinder from the cradle to the grave! So much for the idea of living out one's life inside a large, filtered, thermodynamically isolated system. Fluids get stirred and mix, by their very nature. It is obvious that the oceans and the atmosphere of this small planet, too, are subject to this natural phenomenon. What is surprising is that such an obvious thing should be overlooked by a species that claims to be intelligent! Truth is truth, but today it come late because of negative minds. Today Negative is speed more than Positive. so we are all join hands to fight this negative and make more positive with Mind Speed. Surely we will WIN. To Create Positive Peace world for your Children. I read the Article carefully which is writeen by sunita narain, many thx to him for his good effort.I think its a comprehensive popular Article which is, can be helpful to us what is right or wrong way to takeing right decission. so,said writing may be showed to us clearly. Best of luck. What you have commented upon is the true picture. Almost everyday I find people traveling in cars/SUVs etc. with air conditioners on even at the time when there is no need to run the air conditioners, like early mornings and late evenings. They carry the impression (totally wrong and unscientific) that the air conditioner can purify the air and make the same pollution free. In fact people who do not run the air conditioners raise the glass panes at traffic intersections and in polluted stretches thinking that they can protect themselves from the outside pollution. You have rightly informed that air conditioners can enhance the level of pollutants inside the vehicles. Same is the case with vehicles with windows shut. The problem is that we do not get the right kind of information. As far as controlling pollution is concerned, neither the government is concerned nor the common people. It has been taken for granted. Recently, the Pollution Checking fee has been enhanced to Rs 80/- from 45/- for cars. That means even more people will try to avoid checking pollution level. They know that if they are caught without valid PUC, they can easily get rid off by paying Rs 50/- or so to the Traffic person. Why should they spend more on PUC? The so called thinkers and planners in India lack the basic knowledge of the fact that we depend on trees for purification of air. The city planners in Bangalore has cut down nearly a lakh trees in the name of development. No one bothers about trees which does the work of purification with no expenditure. Kudos to Sunita Narain for a thought provoking article indeed. The fact has once again belied the belief. AC school buses are more of a fad than necessity. With this revelation should we need to re-write the Air benchmark under the GSP where Health of School Vehicles, Commuting Practices and Ventilation in Rooms are accountable for seventy percent of the total score. To my mind health of the individual is more important than the comfort. If the idea gets well with people at large, are we reverting back to sleeping in the open and terraces (community pattern in vogue in most parts of the country till mid 70s). As regards ambient air quality and the adoption of moving to greener areas the issue can be tackled by restricting the use of the vehicle and outings in comfortable hours avoiding full sun. Incidentally this reminds me of the Raj era when both Indians and the British used to cover their heads compulsorily with turbans and hats respectively. Brilliant. How to get Delhites to read it? wonder how many in that filthy city subscribe to DTE? Anyway, i don't think even if Jayanthi Natarajan and Sheila Dixit read it, they could do much about pollution in Delhi or any other city in India for that matter. Reason, the enforcement of laws in this country is quite impossible as long as transfers, postings and tenures of officials are in the hands of politicians. To address this fundamental issue we need administrative reforms and stop wasting our time on whether the poverty line is at Rs 32 or 22 or other such non issues. For instance why can't all offices of one ministry be under one roof and accommodation to babus allocated nearby? The fuel and time this would save! Too difficult a proposition for our politicians to handle I suppose. I do agree with you that Indian literates are environmentally illiterate. Not only Indians but theses so called literates from all over the world are responsible for making earth a hell. Harder to drink and tougher to breathe. Money making literacy have made them socially blind. We want go away from the problem instead of fighting it.Your article is eye opening and encourages to fight pollution change habits and life style. We should travel by bus even if we can afford to use own car. This is hard to digest. We should remember we are in a common public health system. It does not differentiate between rich and poor. Sunita Narain's message and the essay is no doubt impactful. But I wonder how many people would read this, would actually follow this and stop travelling in air-conditioned cars, & stop the ACs in their offices or in their homes. The problem is not just with the air conditions or room heaters or any blah blah blah... we write a lot of things, speak even more, but hardly apply to our own lives. Hardly anyone of us have that much courage. Because obviously, once you get the luxury of cool air, who would even want to switch over to ceiling fans?? I agree. The same applies to Air-conditioned buildings but the problem is that most designers believe that we escape pollution as soon as we go inside the buildings. In fact, the opposite is true. We donÃ”Ã‡Ã–t escape pollution by staying indoors. Indoor pollution has been found to be as much as 5 to 10 times higher than outside levels. The best quality air we can expect inside any building is the same as outside. This is obvious when you think about it, as our buildings are literally bathed in this outside air. We know that we can only clean the air, any air, properly if we use very expensive particulate and charcoal filter systems, normally reserved for special situations. For the majority, it is a case of Indoor air=Outdoor air+whatever we add indoors. The Ã”Ã‡Ã¿tighterÃ”Ã‡Ã– the building, the longer the added chemicals remain and the higher the indoor contamination. Buildings are often designed to be Ã”Ã‡Ã¿tightÃ”Ã‡Ã– for reasons of energy conservation and other running costs. The rationale is that heating or cooling Ã”Ã‡Ã¿freshÃ”Ã‡Ã– outdoor air requires more costly energy than recycling indoor air, which is already about the right temperature. This is false economy because recycling air can spread disease. We must be clear about one thing, and that is that airconditioning systems do not produce pure fresh air, they only contaminate it. People often add their own viruses and bacteria to the airconditioned air. Scientists have recorded that even a simple normal cough produces 5000 droplets of liquid while a sneeze may generate a million. Even the use of a handkerchief does not help. Bacteria spread everywhere throughout the building where the air is circulated. Diseases, like measles in airconditioned schools and the sudden outbreak of flu among office workers, have been recorded. In Delhi we must celebrate one day in a month that no four wheeler is allowed to run on road as done in Ahmadabad for few hours on Sunday in a week. Also, in Delhi there must be law no single person is allowed to drive vehicle, minimum two persons/vehicle are allowed to run four Wheeler vehicle on road. This will increase the pooling culture, increase use of public transport, low emission levels, less pollution.